Detective David Dupont said a homeowner arrived home just before 4 p.m. Aug. 1 to find his 72 Fern lane home burglarized. A Marshall amplifier and electric guitar, kept in an upstairs office, were missing along with a pocketbook, a Coach wristlet and $100 taken from a bedroom closet. Dupont said the burglar went through every room of the house, leaving drawers open after rifling through them. 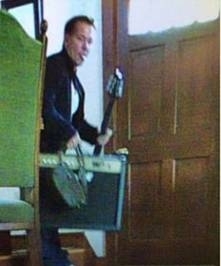 Unknown to the burglar, the homeowner had set up a hidden camera and captured two pictures of him smiling and a third with his tongue hanging out, while holding the guitar, amplifier and purse. The photos had a time stamp of 12:40 p.m.
Dupont said the homeowner set up the camera in the event someone broke into his residence, which is located in the Crystal Lake area of the city.